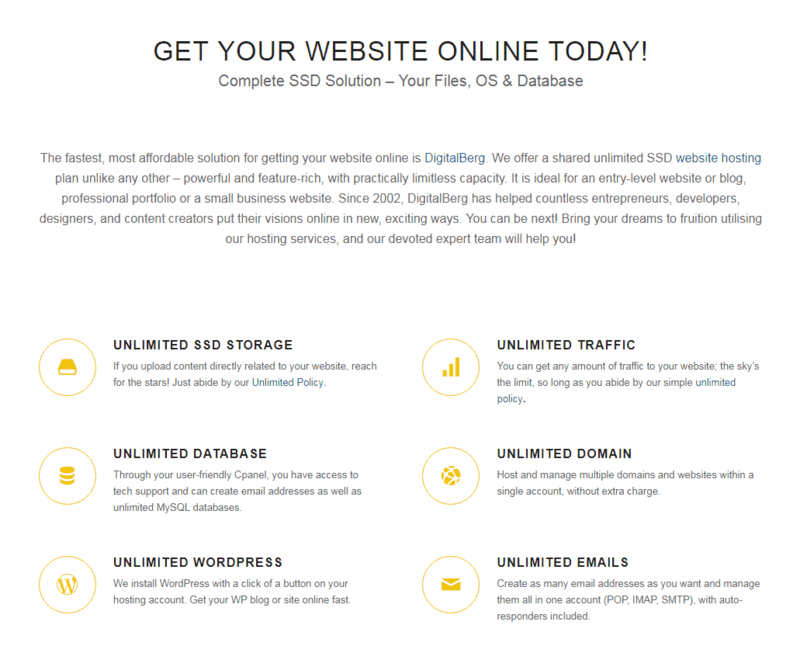 Digitalberg Review 2019: Is Digitalberg a Good Hosting? DigitalBerg is the perfect web hosting service for those looking for unlimited bandwidth, storage, email accounts, and databases. They combine all those features into a single package and top it all off with high-quality servers and infrastructure. DigitalBerg is a U.K.-based website hosting provider. They currently serve over 409,000 customers in 99+ countries with a professional 24/7 support staff and some of the best servers in the industry. They not only serve casual bloggers and freelancers, but also supports larger organizations as well as multinational corporations. Apart from website hosting services, they offer services such as domain registration and transfer. They have offices in the U.K. and the United States. DigitalBerg has clearly invested quite a bit into establishing a first-rate range of servers. Their SSDs have capacities up to terabyte-class which, together with their high-performing processors and abundant RAM, make their servers fast, stable, and more importantly, extremely reliable. These servers enable them to offer fast website loading speeds both for WordPress and normal websites. They feature Control Panel Ultra, a custom-designed control panel based on the popular cPanel. A high-performance hosting account is what you can expect thanks to their multi Deca-core processors and 196GB dedicated RAM, all on Linux-based servers. The turbo server allows faster page loading speeds of up to five hundred times, and their RAID enterprise SSD drives and GigE Uplink ensure high-quality service at all times. Plus, good news for WordPress fans: Digitalberg is not just your typical shared and VPS hosting provider. They’re also staffed by a team of WordPress experts, which means you can get dedicated WordPress support for your website should any issues come up with the popular CMS or its third-party apps. The best thing about DigitalBerg is that you don’t have to worry about bandwidth. They offer unlimited bandwidth to all users, so even if you have massive traffic on your website, you can rely on them to deliver. The unlimited availability extends to disk space, databases and emails as well. They top this all off with a dedicated support team to ensure you get settled in well and have no issues making the best of their offered features. SSL certificates aren’t included and need to be bought separately. They offer a single package to their shared hosting customers. This package includes a free website builder from SiteBuilder.Ninja. You also get unlimited storage, bandwidth, databases, domains, and emails, which is great. Their price may be on the higher side, but considering that they offer so many unlimited resources, it really is an attractive price. If you’re willing to spend a bit more, you can also get add-ons such as SSL certificates and a unique IP address. You can easily get in touch with them through the contact form on their website. Their live chat is only accessible when you login to the user portal, but they do promise 24/7 availability via this channel. Disappointingly, their support ticket system wasn’t working when I tried it out. When you become a member, you may have access to the ticket generation system but for non-customers, it’s giving a 404 error at the moment. DigitalBerg’s strength is that they offer unlimited features, including storage, bandwidth, emails, and databases. They’ve invested quite a bit into establishing state-of-the-art data centers around the world, ensuring top-notch website loading speeds and performance for their customers. Wondering how Digitalberg stacks up against other Web Hosting companies? Enter any other Web Hosting company and we will give you a side-by-side comparison.